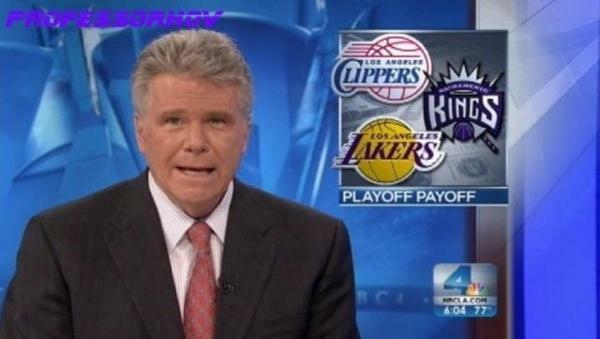 This picture comes courtesy of the NBC station in Los Angeles in a segment talking about the city’s three professional sports teams currently in their respective playoffs. Notice something amiss? That’s right, the logos shown are those of the Los Angeles Lakers, Los Angeles Clippers, and… SACRAMENTO Kings! Sure, the 8th seeded Los Angeles Kings may not be getting the respect and notoriety their playoff run deserves nationwide, but this is a bit of a low blow coming from your own local station. It would be one thing if this were a generic Kings logo with a crown and all, but for crying out loud, the thing even says “SACRAMENTO” on it! This would be slightly amusing but somewhat understandable if we’re talking the NBC station in Huntsville, Alabama or Lancaster, Pennsylvania, or even Myrtle Beach, South Carolina… but my God, this is your own team Los Angeles. C’mon man!